Providence Resources says its been offered a licensing option for another 500 sq km beside the Barryroe oil field. 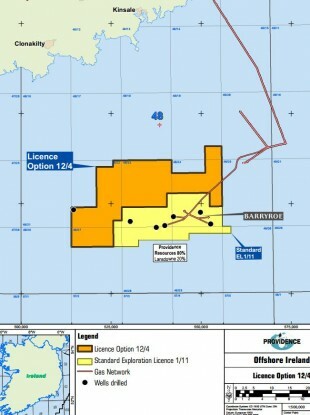 PROVIDENCE RESOURCES, THE oil and gas exploration company which has its sights set on the potential of the Barryroe oil field off the coast of Cork has been offered a new licensing option over some adjacent sites. In a statement the company said that it’s been offered a two year licensing option over five part blocks adjacent to Barryrow, which Providence said last month could yield as much as 1.6 billion barrel of oil. The new sites are located to the north and west of Barryroe and cover an area of around 500 sq km. The licensing option gives Providence two years two decide if it wants to commit to drilling a well. The prospects of the option area will be assessed to see if the Barryroe oil field extends into this new area. Providence holds 80 per cent of the control over the new blocks, while partner company Landsdowne Oil and Gas control the remaining 20 per cent. Chief executive of Providence Resources Tony O’Reilly said that the licensing option granted offered by the Department of Communications, Energy and Natural Resources increases the “acreage position in the most prospective central part of the basin”. Earlier this week Providence announced that it may have found evidence of another significant oil or gas find off the west Cork coast, at the Drombeg Prospect, located in the south Porcupine Basin. Another oil or gas discovery off the west Cork coast? Email “New licence could extend Cork's potential oil field”. Feedback on “New licence could extend Cork's potential oil field”.